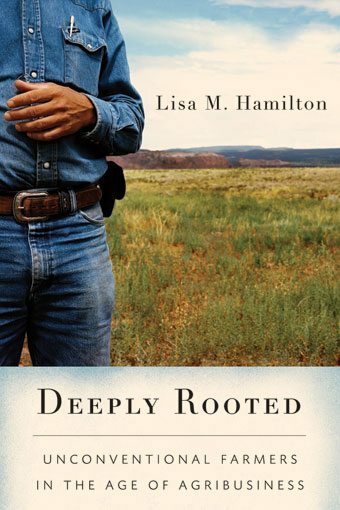 Thought we’d share the introduction to Lisa Hamilton’s book Deeply Rooted. Hamilton is a writer and photographer who focuses on food and agriculture, particularly the stories of farmers. Highway 84 cuts a diagonal line across central North Dakota, a landscape of wheat. It’s a lonely road, two lanes stringing together a handful of farm towns small enough to come and go in the space of a sentence. Velva. Voltaire. Bergen. Now Balfour. As I drive I’m looking for something to eat but in vain, and not just because it’s Sunday morning. At Balfour there seems to be hope in the form of a roadside café, in front of which a big sign calls TRUCK STOP. Closer up, though, I see in the parking lot what has unintentionally become a sad joke: three trucks “stopped” here years ago and now rusting their way back into the earth. I’ll bet the café has been closed for twenty years. A few houses here are still lived in, but mostly Balfour appears to be closed. Next to the café, a cottage has been swallowed up by the bushes that once formed its hedge. Across the highway on the railroad tracks sit eight empty cars, graffiti spreading across them like cobwebs. Beside the tracks is a collection of abandoned tractors. In the stillness, fluffy seed heads of Canada thistle drift up and then down, tracing the soft curves of the air. What caught my eye, the reason I pulled over and got out of the car, is an old, wood-shingled church. Built probably in the 1920s, it’s a strangely huge building: two stories inside with a third-story bell tower, itself crowned with a steeple that reaches another fifteen feet into the air. At the very top is a delicate wooden cross, backlit by the sun. I soften my eyes to blur the massive building back to some former grandeur. But as my focus returns, I see its white paint peeling off like old skin, and weedy wormwood grown over its path. I see on the building’s front the words for sale spray-painted in red beside a phone number with an area code from North Carolina. As I stand looking at the silent church, a convoy of trucks surges down the highway. According to the names on their cabs they normally transport ag equipment, but today they’re hauling out the carnival from the state fair, which closed last night. Blowing down the road comes a candy-colored coupon booth on its side in the back of a flatbed, then a blue-and-lavender kiddie ride broken down to its clanking pieces, then a grown-up ride in red, with flames down its flanks and its outline marked by orange light bulbs. The colors stream through town at fifty miles an hour. Wind kicked up by the trucks sends the thistle seed-puffs reeling, their slow dance suddenly plunging and pointed. Watching them, it hits me that the truckers with their blurred faces are the only humans I have seen since I pulled over to look at this place. Of course I know that people live in Balfour; the census says there’s a population of twenty, at least as of the year 2000. This town is not dead. What it is is empty. I get in my car and soon I leave, too. Balfour should be a surprise to no one. In fact, this emptiness is what we’ve come to expect from farm towns. To those of us passing through, this landscape is not supposed to be about people. It is about wheat as far as the eye can see; or in Iowa, corn for miles on end; or in Texas, such endless cotton that in fall the roadsides turn white as if dusted with snow. We know that things used to be different-that in 1950 there were 162 people living in Balfour; that six days a week there were farmers in those fields and that on Sunday mornings the church was so full that the building didn’t seem oversized at all. But we also know those days are gone. The way things work now, with industrialization and consolidation and combines navigated by GPS, agriculture doesn’t really need people anymore-at least not like it used to. As we have mathematized food production, we have reduced its pieces to numbers and its processes to calculations; humans have become mere inputs, useful only when applied efficiently in relation to the outputs they create. Of all those people once filling the church at Balfour, conventional agriculture needs only the handful in the front row. The rest are fat to be trimmed. As a person who writes about agriculture, I spend a fair amount of time in places that have grown quiet over the past fifty years. Gibbon, Minnesota. Bluffton, Georgia. Unincorporated Fremont County, Wyoming. My visits there are not fast-paced. Indeed, I pass most of my time sitting: in the passenger seat of a truck, on the wheel well of a tractor, on whatever flat space is free in the cab of a combine. But as my hosts and I make slow revolutions around a field or drive from one pasture to another, what happens is not dull. What happens is we talk. Or, typically, they talk. On most days the conversation lasts for hours. “They” are farmers and ranchers, though generally not those from the front row of the church, that select few who remain in conventional agriculture. These are the ones who were trimmed off long ago, or at least by the industry’s prescription, should have been. As we sit and talk, the topics are sometimes technical, often political or economic, and always, ultimately, philosophical. And personal. If we start with a discussion of soil microbiology or a comparison of turkey breeds, inevitably we end up in family, history, ecology, faith, beauty, morality, and the fate of the world to come. For them, all those things are linked. As they see it, agriculture is not an industry on the periphery of modern civilization. It is a fundamental act that determines whether we as a society will live or die. What binds these people is not a particular farming method, but rather the conviction that as humans, the contributions they make are essential. Conventional agriculture doesn’t need people for much more than to run the machines and carry the debt, but these people refuse that lifeless role. To the work, they bring their intellects and their consciences, their histories and their concerns for the future. In quiet ways, in quiet places, they have set about correcting the damage that has come from believing agriculture could actually be reduced to numbers alone. The first step: reclaim their place in the center of the equation. That Sunday morning in Balfour, after I left the abandoned church but before I got back on the highway, I drove into what was left of the town. Beyond a scattering of houses, I came to a building that was newer but not new, non-descript except that its doors were wide open. Outside were a few cars—cars that had arrived there that morning, not two decades ago. It was the town’s last working church. Technically it was Lutheran, but the congregation was so small that any person was welcome. What mattered was that they were there at all, listening, talking, praying, and even singing. If the closed-down face of Balfour represents the disappearing human role in agriculture, then this book is about the people in church that Sunday morning. They are the faithful, the ones who believe, despite everything society shows them, that what they are doing is worth it—that it is vital. When their nation tells them this is the way it is, and this is the way it has to be, they do not just fade away. Instead, they talk, and they pray, and they sing at the top of their lungs. To hell with what you’ve decided is convention, they say. We are unconventional farmers.